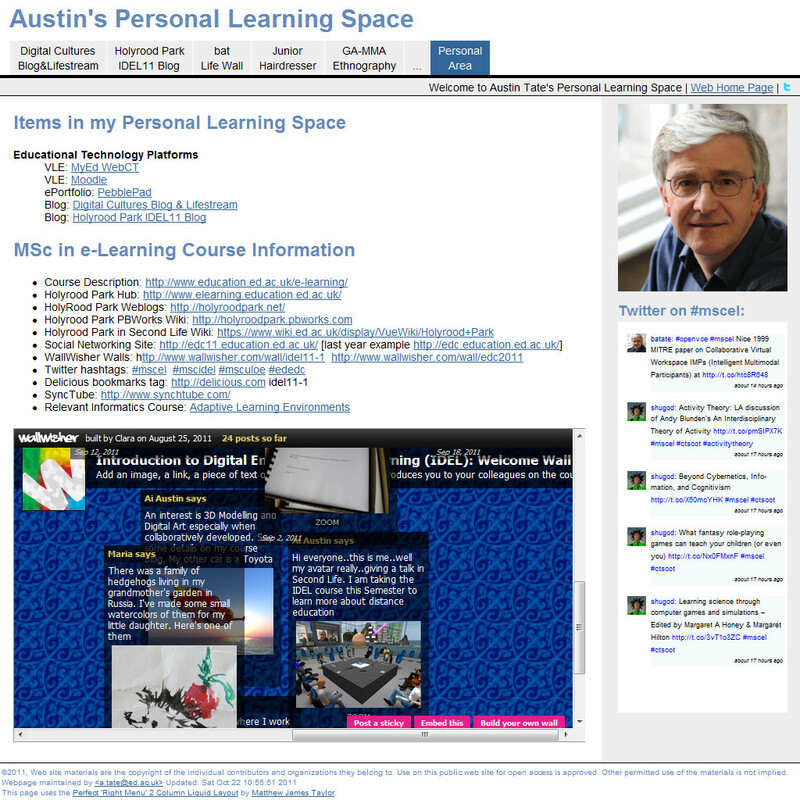 There was an excuse provided by the subject of study on IDEL11 in the last week to look at a “Personal Learning Environment (PLE)”, e-Portfolios like “PebblePad” and “Virtual Learning Environments (VLEs)” like WebCT/Blackboard and Moodle. This was actually quite timely as I was getting concerned that the volume of assets I was creating for the course was getting scattered across the very many social media sites used on various courses, was being locked into the WebCT walled garden for each module, or was being scattered across my own preferred blogging and information sharing sites like OpenVCE.net. I had had an entry page for useful and quick access links for the course at http://openvce.net/mscel since the semester started, but it was inappropriate to personalise that public facing web page too much. I also was starting to build image repositories in my own personal web area at http://atate.org. The initial result is at http://atate.org/space/. There was quite a flurry of activity in my blogs and hence my lifestream this week related to Moodle and the Second Life link up via the SLoodle module and in world classroom object “rezzer”. An updated web/PHP platform to let Moodle 2.1.2 (the latest version) run on one of our servers was put in place last week allowing proper experiments to begin. There is a SLoodle classroom on the VCE region of Second Life and I am blogging and tweeting to the SLoodle community about progress in testing. There are some small issues that are being addressed in the “alpha” grade code currently under review. It is a good time to give feedback to the SLoodle community as they are close to trying to create the first “beta” version of the Moodle module that will be able to run with the latest Moodle 2 versions. My PhD student, Punyanuch Borwarnginn, who is working on Intelligent Learning Environments also has a course set up. She also has her own I-Room/Classroom space on Vue North in Second Life, and is now a course creator in our Moodle system. See http://openvce.net/ile . There was a flurry of lifestream events related to my completion of a “learning challenge” for the ULOE11 course. 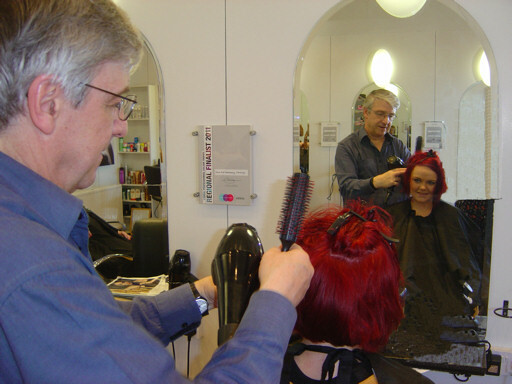 This was a fun challenge to learn one of the skills taught to junior hairdressers. I took this seriously and probably went a bit over the top with the effort put in on it. But it was very enjoyable, and I am pleased with the results. The lifestream events show my various blog postings as I went along. See http://atate.org/mscel/hair/ for a summary of the whole show. I have created a colour printable version to provide back to the good people at the hairdressing salon who helped me. I notice that a lot of my activity on the “Digital Cultures” course does not appear in my lifestream as much of the discussion is now on a non-public Discussion Forum. The ethnography study also involves personal analysis of the corpus of messages from my virtual community… GA-MMA. The emerging results are being created at http://atate.org/mscel/ethno/. Finally, this week we also heard that John McCarthy had died. He was a pioneer of AI, and the one who coined that term. He was a great visionary too. I made several postings and tweets about his life, and gave pointers to his fun and perceptive short story… “The Robot and the Baby”.